More humans means more demands of nature. The demand for wood, wood products, and additional space for agriculture has resulted in worldwide loss of forests. What people all over the world are beginning to recognize is that the world’s resources are finite. There is just so much land, just so much drinking water, just so much of everything. When there were fewer human beings there seemed to be enough natural resources for everyone to share. Times have changed. Subsistence farming in southern China. Photo by JialiangGao via Wikimedia Commons. Historical records of the Chinese civilization go back 4,000 years. In 300 BC, when Europe was a wilderness and the culture of ancient Greece was blossoming, 20 million people lived in China. Then, even in its most densely populated areas, there were between two and three hectares (4.5 to 6.7 football fields-worth) of farmland to provide food for each individual. (A hectare is an area equal to 2.25 football fields.) By 1990 with a population exceeding a billion, there was less than 0.1 hectare (one fifth of a football field) of land per person for food production. In comparison, in the United States in 1994 there was almost 0.8 hectare (1.7 football fields) per person for food production. Over the last 40 years, China’s agriculture, cities, energy supplies and forests have all come under increasing stress because of the population which has more than doubled. With increased consumption of resources, the need for fuel has lead to destruction of forests. The revered leader was tragically wrong. His plan was to change China from an agricultural society into an industrial country in a very short time. It was called the “great leap forward.” But at that time farms were run by communes, which received no benefit from increases in production. In some cases the communes harvested what they needed for themselves and left the rest in the fields. Shared farm machinery was often not available when needed and crops were lost. These inefficiencies led to a reduction in the food supply and produced the greatest famine in human history. In the years between 1959 and 1961 an estimated 30 million people died because of lack of food. Today, the communes have been disbanded and Chinese farming returned to family operations with the government entering into production contracts with individual families. Feeding the present population of 1.1 billion people is a massive problem. China has one-fifth of the world’s population and only one-fifteenth of the world’s farmland. If it is hard to visualize how many people 1.1 billion is consider this fact; in 1994 more people lived in China than in all of Europe, Russia, North America, Japan and Australia combined. The growth of this massive population has drastically affected the environment. Forests have disappeared. Water supplies are growing short. Pollution from increasing use of fossil fuels is poisoning the atmosphere. A common ailment is the “Beijing cough” which is increasingly heard in Chinese cities. The air is loaded with particulates and greenhouse gases. Ozone readings in Beijing, Guangzhou, and other Chinese cities are more than three times the average in Los Angeles. Carbon dioxide emissions from the People's Republic of China. Source: Trends '93, Carbon Dioxide Information Analysis Center, Oak Ridge National Laboratory. China is the world’s leading coal burner and at the present rate of increase will double the burning in the next 20 years. 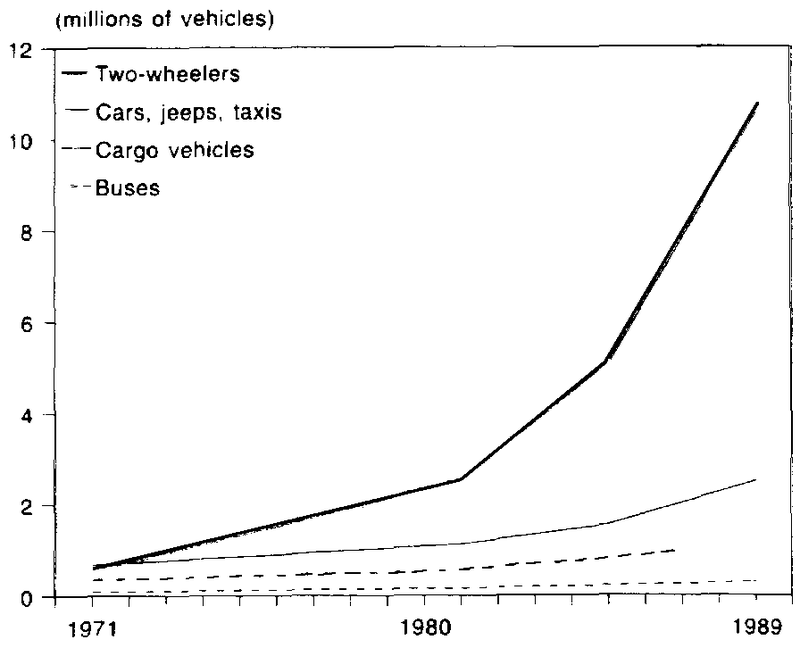 In addition, although the major means of urban transportation is by nonpolluting bicycle, the use of automobiles is increasing. In 1970 there were only 613,000 automobiles in the nation. In 1990 their numbers had increased to 5.8 million. Government policy is to create an automobile industry and in 1993 it produced 1.3 million new cars. Government officials hope to be producing 3 million new cars each year by the year 2000. Ultimately, the challenge that China faces is the same one that faces all countries in the world; how to achieve the benefits of industrialization without disrupting the global systems upon which the quality of life depends. But in China’s case the large numbers of people and their long period of land development have made the problem more acute. And what happens in China has important repercussions throughout the world. Demogaphic transitions, China vs. Denmark. Population pressures may have encouraged people to seek work in the cities and migrate from their rural dwellings. Urban stresses such as pollution are magnified. In the transition from rural society to industrialized society, the rural characteristics of high birth rate and high death rate both go down, but not necessarily the same amount. 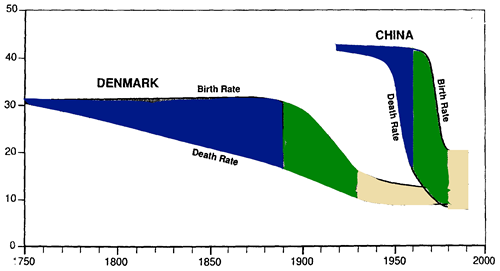 The chart on this page compares the demographic transition in Denmark and in China. The rate of China’s change has been extraordinary. The kind of change that took 230 years in Denmark has been accomplished in China in only 70 years. This rapid change is only possible under an authoritarian government. This speed up of the demographic transition in China was accomplished by controlling the birth rate though laws and regulations. But the forced reduction in birth rates has resulted in much pain and suffering. The growing urban poor populations threaten to engulf the cities. The potential for epidemics is growing. There is no immediate solution in sight to the problem of providing water and sanitation for the growing numbers of people. The United Nations clean-water standards call for 98% of water samples from any one area be free from coliform bacteria from human excrement. By this standard almost all of India’s surface water resources are polluted. The river that passes by the capital, New Delhi, receives an estimated 200 million liters of untreated sewage each day. A century ago over 40% of India’s land was covered with forests. In 1991 a government survey showed that the forest cover had diminished to only 19%. Wood is the primary fuel for the urban population and that, combined with exploitation of the timber lands by the government itself decimated the forests. The government owns 97% of the forest land. In order to raise revenues, wood was sold at low prices. Paper mills and plywood companies set up facilities and harvested the trees until the supply was exhausted. Then they moved on to another area. Recently the government has reversed this disastrous course and the 1991 survey showed a small increase in forest cover since an earlier 1989 survey. As in all countries where intensified farming is practiced, India is endangering its resources for food production. Soil degradation affects about 59% of India’s total cropland. The damaging agents are water and wind erosion, salinity, water logging, and loss of soil nutrients. Excessive irrigation is responsible for both the water logging and salinity that reduce food production. Water logging is the complete saturation of the soil, causing plants to rot. Salinity results when, over a period of years, the water evaporating from the surface leaves behind an increasing amount of salt deposits. Corrections to preserve the soil and prevent increase in water logging and salinity are known but the funds to make the improvements and to educate the farmers are not available. Most early Americans were farmers and the boundaries of settled land moved further and further West as the population grew. The settlers came to a land covered with virgin forest. American Indians who lived in forested regions along the East Coast practiced a system of agriculture, which did not degrade the productivity of the land like the large tobacco, and cotton plantations that replaced them. The plains Indians harvested buffalo in numbers that did not seriously deplete the herds over the years. But for the settlers, the first task was to convert the forest into land that could be farmed. Tree by tree, and farm-by-farm, with axes and saws, they cleared the ancient forest. The line of the frontier moved over the hills as a great sweeping away of the forest. When settlers reached the Great Plains in the center of our country, fewer trees needed to be chopped down; but the environmental change was extensive nonetheless. Vast herds of buffalo were exterminated and replaced by cattle and sheep. In the place of the prairie grass, that stretched from horizon to horizon, many areas were turned to wheat farming and were enclosed by barbed wire fences. The Great Plains became a land blanketed with farms, dotted with trading centers that grew within a hundred years into complex industrial cities. To be sure, no other species changes the natural environment as much as the human species. We increase greenhouse gases in the atmosphere, deplete the ozone layer, change Earth’s habitats causing loss of species, create pollution. A growing human population needs space to live. In many countries it means building on land previously used for food production. According to some experts, that would reduce the food supply. However, some scientists and agricultural specialists believe that by boosting crop yields more food can be grown on less land. Through irrigation and modern farming methods some lands previously thought unfit for farming can become food producing. Moreover, in many places in the world, food goes to waste. If better ways to distribute food were established, fewer people would go hungry. If farming technology were spread more widely more farmers would have better yields. These scientists and specialists believe that if the will is there, human inventiveness can find ways to improve the food supply. Soil is a basic natural resource. It is renewable since it is a product of forest and plant growth. But when the ground is exposed for farming, erosion of topsoil becomes a problem. The average rate of erosion is about three times the rate of soil production. Over much of the Earth’s surface the base of soil for plant growth is only a few inches deep. In some places the topsoil is gone and previously fertile land is desolate. Advances in conservation methods have reduced the loss of topsoil during farming. But the increased demand for food combined with the availability of fertilizer has led many farmers to abandon traditional rotation of crops that can build soil in favor of intensive one-crop farming. Department of Agriculture figures showed that in Missouri, when land was planted with a corn-wheat-clover rotation, it lost an average of 2.7 tons of topsoil per acre each year. Comparable land planted continuously to corn lost 19.7 tons per acre per year to erosion. A thinning of topsoil leads to a loss of fertility and eventual crop failure. Technology developed in the industrialized countries has enabled us to change our diets. We can eat vegetables at any season of the year. The process of canning has given us the ability to extend our food supply and vary what we eat. Technology has given us farm machinery that has increased food production. It has also displaced hundreds of thousands of farm workers. Technology has also produced the chain saw. The buzz of the chain saw has, for the past decade, been the sound of the destruction of the rainforests of the world. In Brazil, landowners have cleared large areas of the tropical trees and converted the land to pasture. Modern transportation and refrigeration have enabled meat from cows raised in these pastures to reach Western countries where it satisfies the hunger of millions of hamburger lovers, particularly in the United States. There is something paradoxical about many American’s eating habits. We eat, gain weight, struggle to reduce and then we eat some more. Red meat is a particular favorite. However, meat as food is wasteful of energy. It works this way. The primary source of food energy is the Sun. Only a small amount of the Sun’s energy is captured by green plants and converted into stored chemical energy. When herbivores, like cattle, eat the plants only a small portion of the energy of the plants is converted to animal tissue. When we eat meat, only a small amount of the energy of the animal tissue is made available for use in our bodies. There is a loss factor of 10 at each step of energy conversion. If, in a particular area, the Sun provides a thousand calories of energy, the plants can capture only 100 of them. The cattle eat the grass but can convert only 10 calories out of the 100. When people eat a quantity of beef that contains 10 calories they can extract only 1 calorie. So, it takes 1000 calories of sunlight to produce just 1 calorie from beef. But, if we got more of our energy from plants, we would be using the Earth’s resources more efficiently. Calculate the amount of land required to produce the food eaten by an individual for one year; compare the production of animal versus plant products. The loss of topsoil is an example of the depletion of a renewable resource to the point where it begins to disappear. There are other examples of how renewables can become non-renewables when the generating stock is reduced below a certain level. The destruction of the tropical rainforests is the result of human population growth. When the trees are cleared for farming by the people moving out from the crowded urban centers, first the trees and brush are cut. Then they are set on fire. The forest floor is exposed and the ashes supply nutrients for the crops which are planted among the stumps. Heavy rains wash out the minerals and nutrients, so farming may proceed for a few years but soon only scrub grass can grow in the soil. Cows may be pastured there but even they will not be able to find food after a while. The trees, which were the base of the ecosystem, cannot grow back because it was only the recycling of dead plant growth that provided their nourishment in the original rainforest. When, after a few years, the crops begin to do poorly it is time to move on. The people move to a new uninhabited place in the forest and begin the process all over again. The process is called slash and burn. When the human population was low the process could continue, as it did, for thousands of years. The slash and burn areas were small in relation to the forest and as the years passed the burned-out areas had time to recover their forest growth before the humans returned. This process fails when the number of people increases. All over the world there are growing examples of ocean crops that are no longer available because of over harvesting. 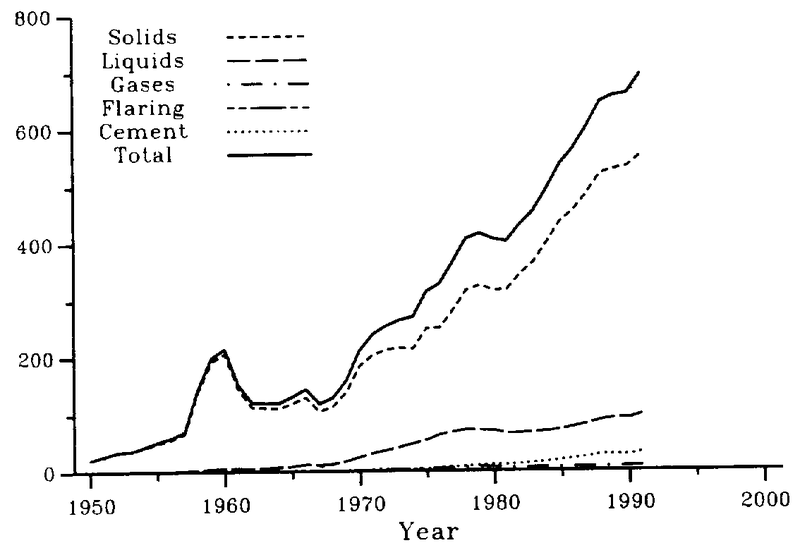 Between 1950 and 1970 the worldwide marine fish catch tripled. New methods of ocean harvesting, factory ships, radar and long drift nets increased the technical ability to catch food from the ocean. In the 1970’s the annual catch leveled off and since then harvests have been declining. Photo by Trevor Rickard via Wikimedia Commons. Industrialized society is based on high-energy use, mostly supplied by the burning of fossil fuels: oil, coal and natural gas. That use will increase as the less developed countries become industrialized. Many people point out that we will come to the end of the fossil fuel supply and that alternatives should be developed now. Others point out that huge supplies remain in the ground and that new finds continue to be uncovered. Two things are certain. One is that there will be increasing difficulty in exploiting the new finds. More energy will be required and more environmental damage will result in bringing them into use. When coal and other minerals are close to the surface, the easiest way to get them is to remove the top layer of soil and rock and simply dig the minerals out. This practice, called strip mining, creates huge holes that change the local environment. Another example of environmental destruction due to the difficult extraction of energy supplies is the increasing number of oil spills that occur when oil tanker accidents occur. The 1989 spill from the oil tanker S.S. Valdez in Prince William Sound in Alaska spread over 150 miles of coastline. The habitat of a countless number of seals, sea birds, and marine animals was gravely affected. The other thing that is certain is that eventually the supplies will run out. This is an example of natural limits. Whether supplies of oil will become 80% depleted in about 50 years, as some studies show, or whether it will be in 100 years, it nevertheless will happen. The same is true of natural gas and coal. Which countries were in the top five for all three categories of per person energy use, urban solid waste production, and water use? Which countries were in the bottom five for all three categories of per person energy use, urban solid waste production and water use? Are global resources shared equally? Explain. Propose a solution to this unequal use of resources. What should be the responsibility of countries that consume large amounts of resources? 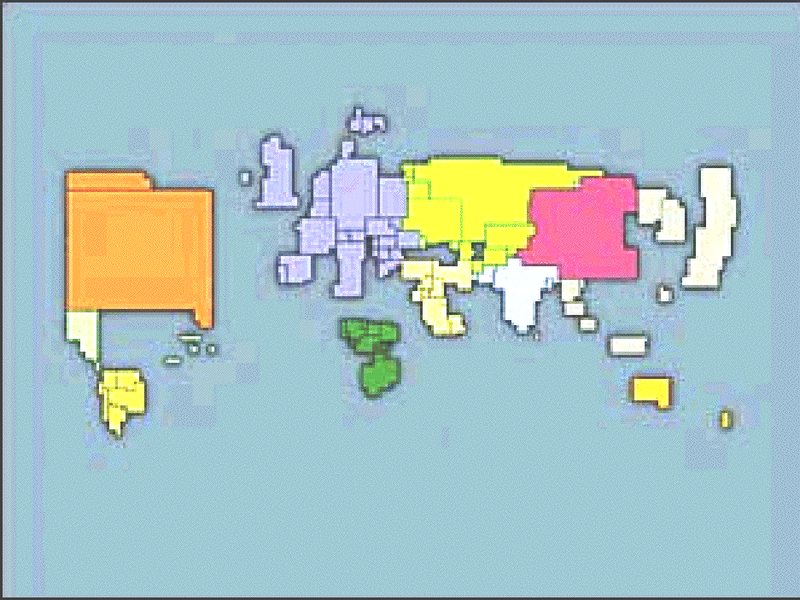 What should be the responsibilities of countries that have large populations? What should be the responsibilities of countries that both consume large amounts of natural resources and have large populations? How would your life be different if you were living in Kenya? If you were living like that and saw a movie about American life, how would you feel? 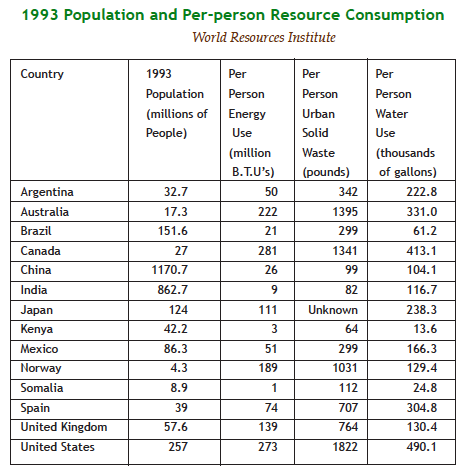 The consumption rates of natural resources vary widely among individuals and nations. Americans on average use more wood and paper products than almost any other nationality. Americans also consume more beef, which takes about 10 times as much energy to produce as the same nutritional amount of grains or vegetables per person. People in the United States and Canada account for approximately 5.3% of the global population, yet they produce about 26% of global CO2 emissions, pne indicator of the amount of energy consumed. While people often equate the amount of consumption with the level of comfort or the standard of living, large reductions in total consumption can be achieved with improvements in energy efficiency, recycling of materials, and changes in patterns of production and distribution. These changes appear to have little effect on the standard of living. For example, Canadians, U.S. citizens, and European Union members are generally considered to have comparable standards of living, yet Europeans on average use 47.2% as many resources per person (in oil energy equivalent units) as their North American counterparts. Certain gases, including carbon dioxide, methane, and nitrogen oxides, absorb heat, and prevent it from leaving the atmosphere. Human activities are increasing the concentration of these gases in the atmosphere. Carbon dioxide and nitrogen oxides come from the burning of coal, oil, and natural gas in automobiles, power plants, home heating units, and industries. Methane is produced by cattle and in rice cultivation. As the world population increases, the concentration of these gases will increase. As developing nations, such as China and India, become industrialized, the buildup of these gases will increase even faster. The destruction of forests increases the potential for global warming because trees absorb carbon dioxide, thus removing it from the atmosphere. Scientists still do not know for certain how rapidly the temperature of the Earth will rise, or precisely what the effects of a warmer world will be. The most important relationship between human population and global warming is in the area of food production. A vital question is: will a warmer Earth increase food production or reduce it? Although there are many unknowns, there are some changes that might produce more food in a warmer world. There would be shorter winters and therefore a longer growing season. 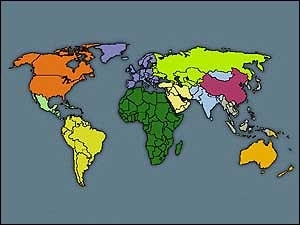 Areas of the world like Canada, northern Europe and the former Soviet Union could become food production areas. In a warmer world there would likely be more clouds due to increased evaporation. Arid lands might receive more rain and become fertile. Since plants convert carbon dioxide to food an increase in carbon dioxide in the atmosphere might stimulate some plants to grow faster. While these effects could tend to increase food production there are other effects to consider. In a warmer world the weather patterns might be very different from those on which food producers presently depend. The additional rain may not fall where humans would like it to fall. Some climatologists predict that an increase in global average temperatures will produce weather patterns that will bring dry spells and drought more often to our Mid-West grain belt while more rain might increase flooding elsewhere. Higher temperatures in the tropics, where some plants are already near their limit of heat tolerance, may reduce the food supply there. Under warmer, wetter conditions crop-eating tropical insects will undoubtedly increase and move northward and southward into areas never inhabited before. Some plants need a certain amount of cold weather in their dormant periods in order to complete their life cycles. Also, it is predicted that global warming will cause sea levels to rise due to the melting of glaciers and the increase in the volume of ocean water as it warms. If that occurs there may be a mass exodus of people from coastal areas where most of the world’s population is concentrated. Certain areas of the world, like most of Bangladesh and much of the states of Louisiana and Florida will be underwater. Visit the website, www.BreathingEarth.net, developed by designer David Bleja and explore the relationship between population growth and carbon emissions worldwide. Discuss with your friends and write down your conclusions about what the data display tells you. There is a party game—a variation on hide and seek called “sardines.” When the hidden person is found, instead of telling everyone where this person is located, you squeeze into the same hiding place. Each person who finds the hidden ones also squeezes in, until, well, everyone is packed in like a can of sardines! It may be a lot of fun, but imagine what it would be like to be packed closely like that all the time. The effects of this may be not only physical inconvenience, but health and psychological repercussions as well. To what extent the conditions of overcrowding contribute to problems such as crime and drug use that plague our cities is unknown. It has been postulated that the failure of city people to relate to their neighbors the way people do in small towns is because there is “relationship overload” in the cities. There are simply too many contacts made in city living to acknowledge them all. The result is a remoteness that sometimes borders on hostility and an unwillingness to get involved with a neighbor. Any inner city dweller can tell you that the stress brought on by close proximity to many people — the noise, pollution, and problems that such closeness generates — can be overwhelming. Migration brings people out of the place where they were born to another land. When national population growth statistics are discussed it is rare that allowance is made for the change in population due to this kind of migration, known as immigration. Immigrants are quite a bit different from refugees, who are people who leave their homes because of war, civil unrest, political, racial, or religious persecution. The instances of genocide and ethnic cleansing mentioned in the previous chapter led to multitudes of refugees forced to flee to neighboring countries. In a large country like the U.S. the percent of population increase due to immigrants and refugees is relatively small. But its social significance cannot be ignored—there is much political controversy over it. In recent times, the movement of people because of environmental decline has added a new dimension to a global refugee problem. Changed environmental conditions have forced large numbers of people to move. Desertification, drought or flood, or land use that reduced the ability of the land to support life, have made refugees of millions in Asia and Africa. If the Earth warms and the sea level rises because of global climate change, additional millions will be driven from their coastal homes. As these people move onto land already occupied the impact on humanity could be incalculable. The history of humankind is full of conflict between groups of people. The causes of conflict between groups are complex and some of them may be deeply rooted in human psychology. But another reason is certainly the struggle to obtain new territory and the natural resources it may contain. Increased population can underlie the need for more territory or additional natural resources. The movement of the western frontier across the U.S. was like diffusion, a movement of people from a place of greater concentration to a place of less concentration. The resultant conflict between the invading settlers and the resident Native Americans is a story of death and misery that is well known. Japan’s need for access to natural resources prior to World War Two is also an example of how need for resources can be a key factor in the start of war. All living systems produce wastes. As a consequence, they tend to pollute the environment in which they exist. Gaseous wastes very quickly pollute the air. Think of how fast, in a crowded enclosed place like an elevator or a subway train, someone lighting up a cigarette can foul the air. Our global atmosphere is also a closed space. Fortunately, the waste gases exhaled by people and other animals are taken out of the air by green plants. But gases such as sulfur dioxide, nitrous oxide, and toxic compounds from industrial processes can linger longer. Human population growth and the pace of human activities are now putting pollutants into the global atmosphere faster than plants or other natural process can remove them. Industrial manufacturing, transportation and home heating are the major causes of global environmental pollution. In the past, industrial wastes were simply dumped into the area nearby or into a convenient stream to be dispersed and carried to some other place; they were thrown “away.” As the world becomes more crowded, people realize that there is no “away.” Other people are living there. Many of them are dependent on the water downstream. As the industrial revolution picked up steam, the rate of waste production rose so drastically that municipalities had to take notice. Laws were passed providing rules for the disposal of liquid wastes. Al Gore in his book Earth in the Balance makes an interesting analogy. He points out that our industrial civilization has magnified in a gigantic way what each of us does. Automobiles have magnified the process of animal respiration—our internal combustion engines mimic the way our lungs take in oxygen, combine it with fuel to release energy, and exhaust carbon dioxide. Factories take in raw material and burn it to provide energy, as power plants do, or they transform the raw materials into new products just as the human body does. In this process of energy production and material transformation solid wastes are produced. Modern industry copies the process of animal digestion. It consumes the trees, coal, oil and minerals resources of the Earth and fouls the global environment with its wastes. In many industrial nations, great emphasis is placed upon packaging. An extra strain is put on the environment in many ways: large, bulky containers are used so that it will seem that we are getting more for our money; small products are fastened by plastic film to large cards, which have to be thrown away. Overpackaging uses energy in unnecessary production costs and consumes raw materials needlessly. The statistics of waste production in the United States are staggering. 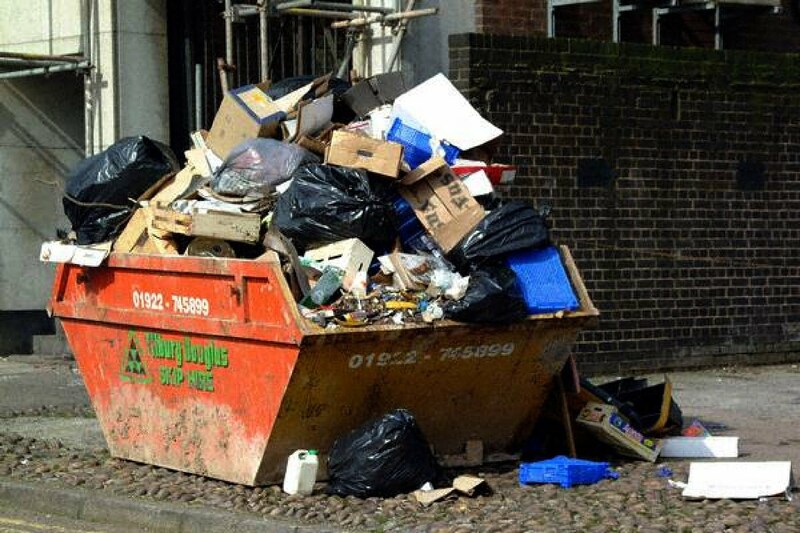 Municipal solid waste is more than five pounds a day for every citizen of this country, or about one ton of stuff thrown “away” by each of us each year. That waste goes to a landfill or is burned in an incinerator that sends exhaust fumes into the atmosphere. Then the leftover ashes still have to be dumped somewhere. To produce all that packaging, American industry produces about one ton of solid and liquid wastes for every man, woman and child each week. That is not counting the gaseous wastes that the smoke stacks pour into the air. Each year twenty tons of carbon dioxide enters the atmosphere for every person in the U.S. Totaling it all up, in the U.S. each of us is responsible for more than twice our own weight in waste every day. If we wish to examine the ecological footprint of “people” on this planet the comparisons of how much people consume (per capita consumption) is helpful. Less than $760/year/person is...	low income. Since low- and middle-income countries produce about 20 percent of the world’s goods and services, but have more than 80 percent of the world’s population, people in those countries have a smaller share of the world’s goods and services than people in high-income countries. GNP per capita can be a rough indicator of the general standard of living enjoyed by the average citizen of a country. In countries with higher GNP per capita people tend to have longer life expectancies, higher literacy rates, better access to safe water, and lower infant mortality rates. Most nations want to increase their GNP per capita by striving to have better health, education, and work skills for people; improving transportation, communication, and energy systems; having better tools and technology; having access to raw materials and capital; getting fair wages and prices for goods and services; encouraging savings and investment; increasing the value and variety of exports; and having better access to world markets to sell these exports. Population growth rate can affect GNP per capita greatly, since the “per capita” element in the definition of GNP per capita is in the denominator of the GNP calculation. Countries that have managed to increase their GNP per capita have tended to contain population growth while following sensible economic policies that can encourage stability and increases in both human and physical capital. While GNP per capita helps measure the material output of a country, it does not show whether the people lead fulfilling lives, what kinds of goods and services the country produces, or whether all people share equally in the wealth of the country. In almost all countries, the richest 20 percent of the population earn incomes that are many times higher than the poorest 20 percent. To get a better picture of the standard of living in a country, you must go beyond GNP per capita to see how income is distributed among all the people. The chart above depicts distribution patterns typical of low-, middle-, and high-income countries around the world. For up to date world GNP data, visit http://geo.worldbank.org/. • Of the world’s 6 billion people, more than 1.2 billion live on less than $1 a day. Two billion more people live on only marginally more. • About 60 percent of the people living on less than $1 a day live in South Asia and Sub-Saharan Africa. • In high-income countries, farmers—men and women—make up less than 6 percent of the workforce, while in low- and middle-income countries combined, they represent nearly 60 percent of all workers. Why do you think that Europeans use so much less resources than North Americans? What are they doing that is different? 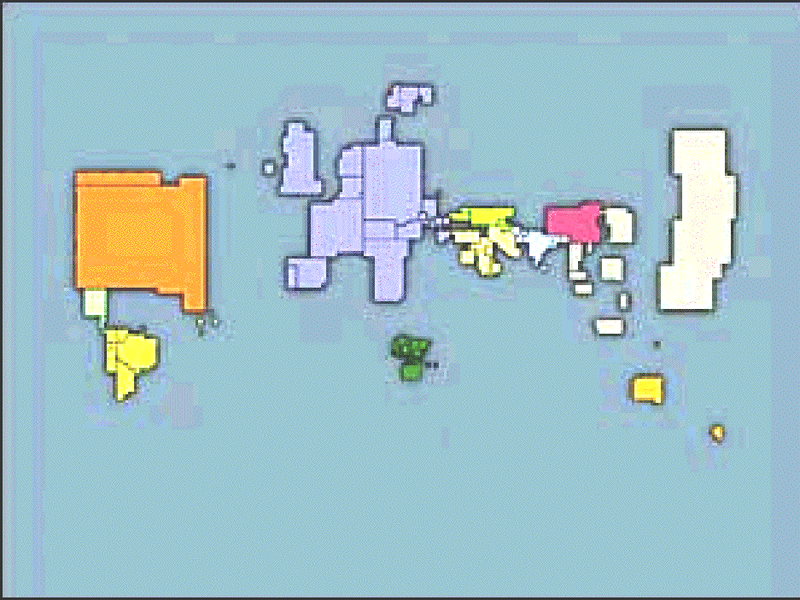 Maps comparing the world's relative geography (left) and the distribution of the world's wealth (right). International comparisons of energy consumption per capita are difficult, especially since there are so many forms of energy and fuels: electricity, coal, oil, natural gas. If we convert all forms of energy to kilograms of oil equivalent we find that low-income countries consumed less than 200 kg oil equivalent per head per annum in 1995. High- income countries consumed more than 5000 kg oil equivalent per head per annum, a multiplication factor of 25. World energy consumption is expected to increase 40% to 50% by the year 2010, and the global mix of fuels—renewables (18%), nuclear (4%), and fossil (78%)—is projected to remain substantially the same as today; thus global carbon dioxide emissions would also increase 50% to 60%. The United Nations estimates that more than 2 million villages worldwide are without electric power for water supply, refrigeration, lighting, and other basic needs, and the cost of extending the utility grids is prohibitive, $23,000 to $46,000 per kilometer in 1988. Among industrialized and developing countries, Canada consumes per capita the most energy in the world, and Italy consumes the least among industrialized countries. Developing countries use 30% of global energy. Rapid population growth, combined with economic growth, will rapidly increase that percentage in the next 10 years. The World Bank estimates that investments of $1 trillion will be needed in this decade and upwards of $4 trillion during the next 30 years to meet developing countries’ electricity needs alone. Traditional biomass fuels, such as wood, crop residues, and animal dung, remain the primary energy source for more than 2 billion people. In 1991, Americans spent about $1,975 per person on all energy purchases. This represents about 7.7% of the U.S. gross domestic product. For comparison, in 1991 Americans spent about $2,280 per capita for housing and about $2,565 for medical needs. Per capita, the United States ranks second in worldwide energy consumption among the industrialized nations. America uses about 15 times more energy per person than does the typical developing country. The United States spends about $440 billion annually for energy. In 1990, commercial buildings accounted for nearly 11% of U.S. total energy consumption. Residential appliances, including heating and cooling equipment and water heaters, consume 90% of all energy used in the U.S. residential sector. Today, 36% of U.S. energy is consumed in electricity generation. By 2010, that will rise to 41%. The transportation sector consumed 35% of the nation’s energy in 1990; this sector is 97% dependent on petroleum. 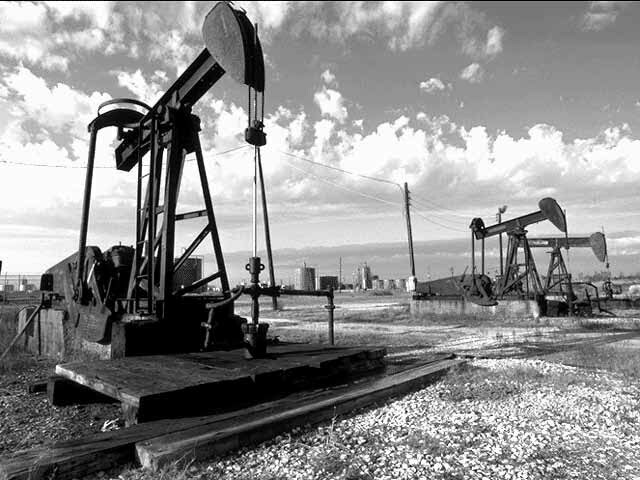 The United States consumes about 17 million barrels of oil per day, of which nearly two-thirds is used for transportation. Oil provides more than 40% of the nation’s primary energy (energy in its naturally occurring form before conversion to end-use forms). The United States imports more than seven million barrels of oil per day. Fossil fuels are depleted at a rate that is 100,000 times faster than they are formed. 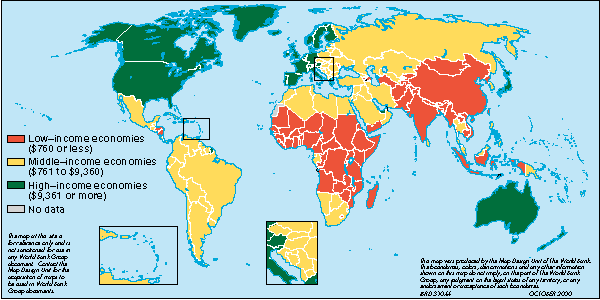 Source of General Energy Facts: International Energy Agency, World Energy Outlook (Organization or Economic Cooperation and Development, Paris, 1996), pp. 237-285. Note: Assumes current energy use patterns. 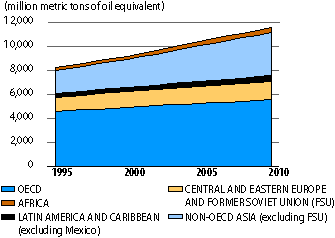 World Energy Use in 1971, 1980, and 1992. M. Levine and M. Hirose. Energy Efficieny Improvement Utilizing high technology: An Assessment of Energy Use in Industry and Buildings; Report and Case Studies, World Energy Councl, 34. St. James Street, London, SW1A 1HD, United Kingdom, 1995. Global energy use climbs steadily over the years as industrial economies expand. According to one model, energy use could increase roughly 40 percent between 1993 and 2010. World total energy use has been increasing at 2.3%/year, which corresponds to a doubling time of 31 years. Aggressive steps to reduce energy use could change the course of these trends. Today, developed nations consume nearly three quarters of all commercial energy. But much of the additional energy demand in the next few decades will come from developing nations that increased their share of energy use from 14% in 1991 to 26% in 1992. Unless countries can control their population growth and the attendant environmental pollution problems the future quality of life for all of their citizens is in jeopardy. The danger extends to those who live in the currently industrialized countries as well. Together India and China have almost 38% of the world’s population. What happens to them and what they do is sure to affect the entire world. Suppose you speak to your friend over the telephone and you make a date to go the movies on Saturday afternoon. Make a list of every use of energy that is required so that you and your friend can enjoy the day at the movie theater. Make another list of every article that needs to be manufactured for you to experience the movie. Compare your list with those of your classmates and see what you have left out. Compare the environmental costs of going to the movies to an afternoon’s entertainment if you lived in a developing nation. Instead of driving 10 miles to a movie you might want to see, you might simply walk to the village square and hang out while you listened to a local musician. Energy is central to our economies, our lifestyles, and our health. It powers industrial production, transportation, and increasingly, agricultural production. It provides services such as heating, refrigeration, and lighting, which raise the quality of life and provide tangible health benefits such as unspoiled food and relief from the stresses of heat or cold. An intergovernmental panel on carbon dioxide emissions has found that in 1990, low-income countries discharged 0.7 metric tons or carbon dioxide per capita compared with a discharge of 12.5 metric tons per capita in high-income countries—a multiplication factor 17.8. In world-wide discussions on policies for reducing carbon dioxide emissions, industrial nations have proposed tradable permits in carbon dioxide emissions, i.e. they strike a deal with a developing country that has low emission of CO2, essentially paying to “use” their unused allowable emissions. What constitutes equity and fairness in this situation? Should countries that have high emissions of CO2 be allowed to “buy” CO2 emission credit from developing countries that emit less CO2? Why or why not? The philosophy that we must have maximum economic growth (a growing GNP) in order to have a healthy society is prevalent. If the growth of the GNP is less than 3% economists and politicians start to worry and governmental actions are demanded to keep the rate of growth up. A higher GNP means more goods produced and sold, but also means more energy consumed and more waste that must be disposed of. Today there are some people saying that it is a myth of American life that “bigger is better,” that growth always means progress. In a finite world it is not possible to support an infinitely growing population or a continuously growing economy. Something has to give. Is maximum economic growth necessary for a healthy economy? What happens to the economy if we start to run out of raw materials? Will technological innovations allow us to continue to grow and provide more economic “pie” and bigger “slices of the pie” for everyone? Subpages (1): 5-1 How Much Land?